Heavyweight 140lb. 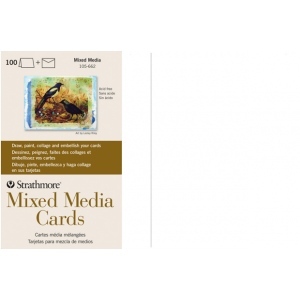 cards offer the attributes of a watercolor paper but with a vellum drawing finish. * They are ideal for watercolor gouache acrylic graphite pen & ink colored pencil marker and collage. * Full size cards measure 5" x 6 7/8". * These larger size cards can be used to design a greeting for any occasion from birthdays holidays and invitations to general correspondence. * Full size matching envelopes are 5 1/4" x 7 1/4".